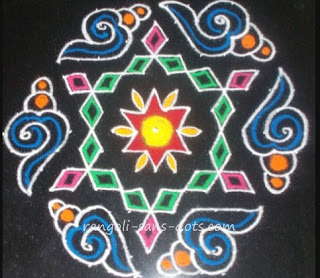 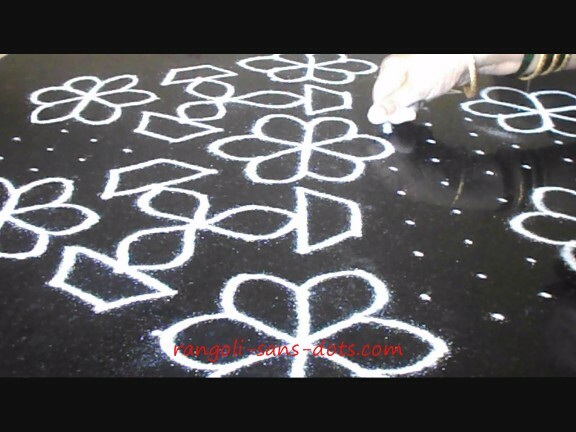 Padi kolam or geethala muggu as we call rangoli designs with lines are traditional and old art of drawing rangoli or kolam . 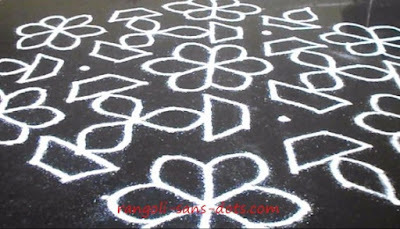 This special and beautiful muggu has been added for 2017 festival of Sankranti . 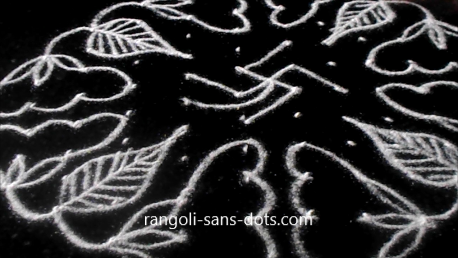 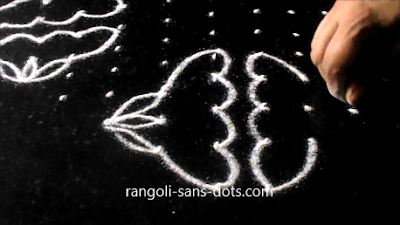 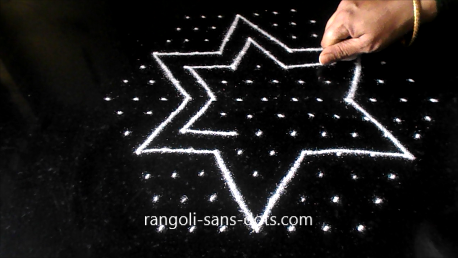 It is quite easy to make this lines rangoli design . 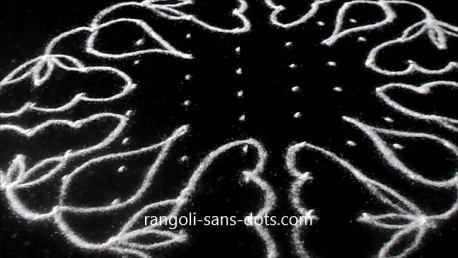 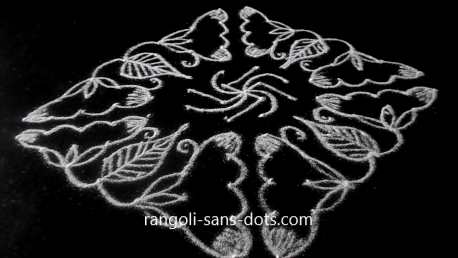 The latest rangoli designs addition to this post that has predominantly free hand rangoli designs. 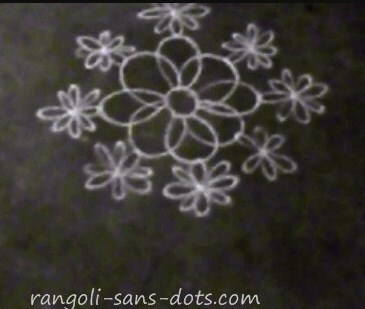 First a 14 dots kolam , a common floral design, a variation of the same the steps shown through images. 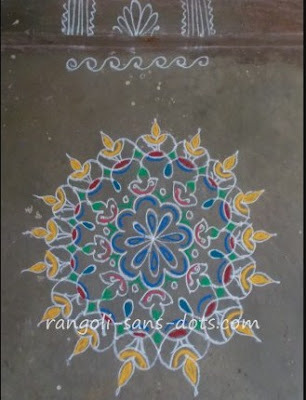 I have stopped at the white rangoli design, we can fill colours as per our choice and imagination. 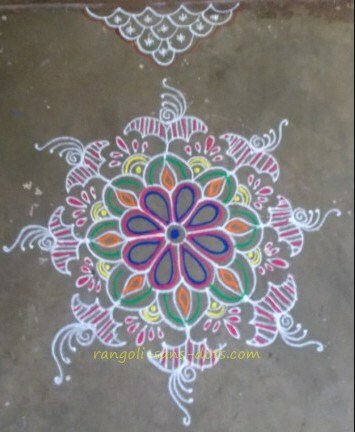 Of course, choosing the colour combination , the right one is also to be given due importance. In brief , this is a 14 dot two rows and then up to 2 dots kolam. 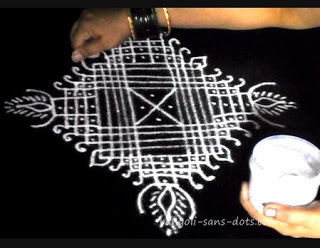 A common kolam it is , I have tried a variation of the same. 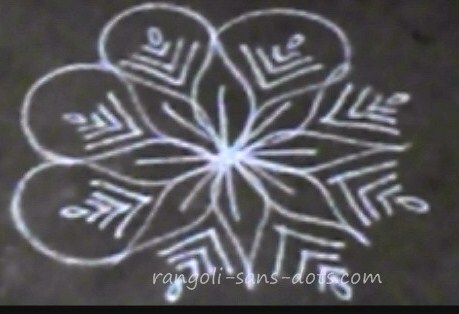 The flowers , the sepals are drawn in pairs on four sides. 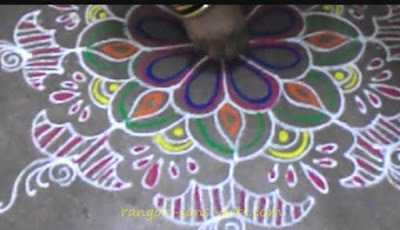 Then the stalks of the flowers are connected. 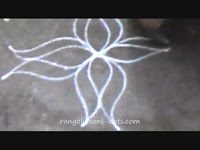 Leaf designs are drawn between any two pairs of flowers. 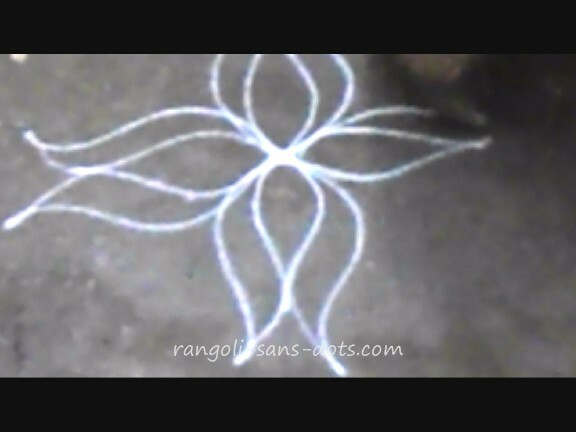 This leaves the dots at the centre. 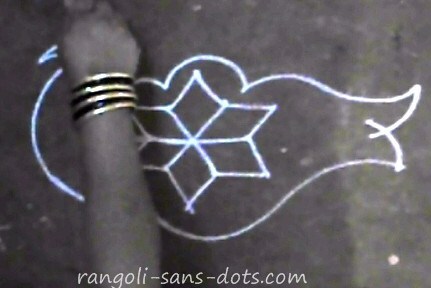 We can add designs according to our imagination and choice. 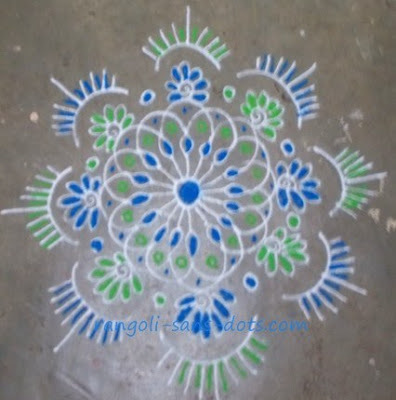 Add bright colours to show off this simple and beautiful rangoli design for Pongal 2017. With bright colours it will be awesome to see at the entrance of our homes. 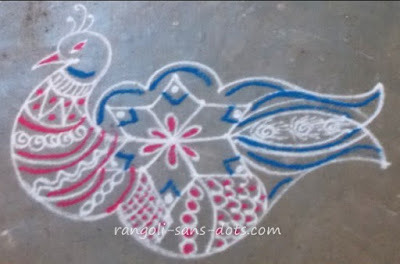 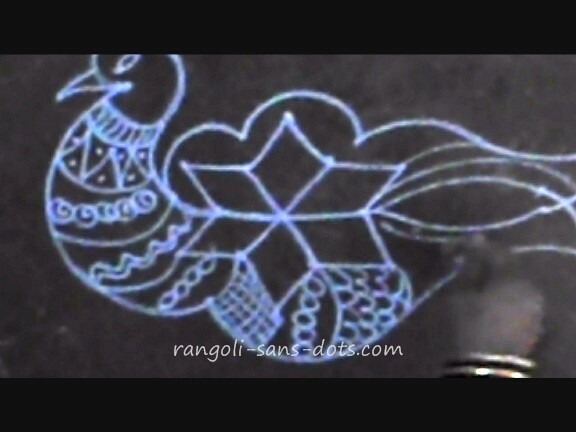 The next free hand rangoli for Sankranti is a birds rangoli design somewhat resembling a peacock. The images show the steps for this rather simple design. What starts as a geometric pattern is developed into a bird like rangoli design. 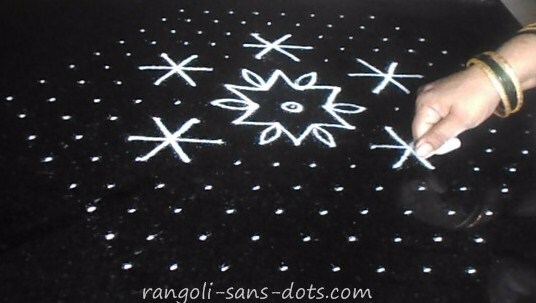 Add patterns inside the rangoli with designs of our choice, sprinkle a few colours and this rather easy rangoli design for Sankranti is ready . 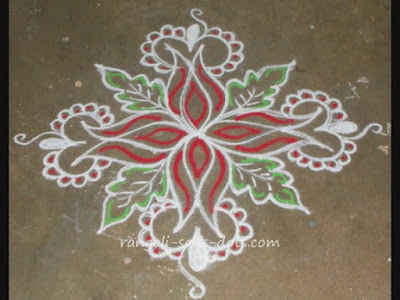 Pongal is a time for celebration, joy . 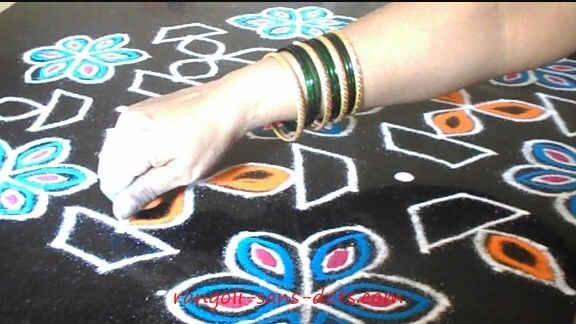 When ever we have festivals and festivities we bring out our joy and happiness through various ways. 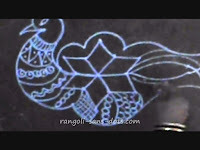 Art is one of them. 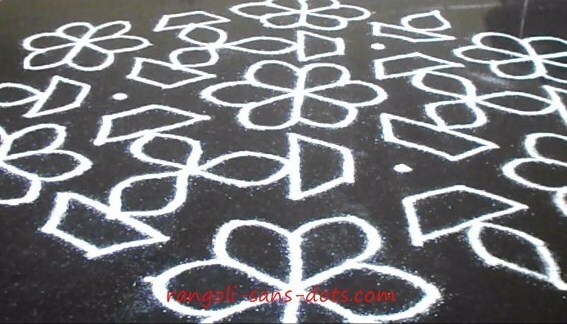 On Pongal day we have colourful kolam adorning the streets. 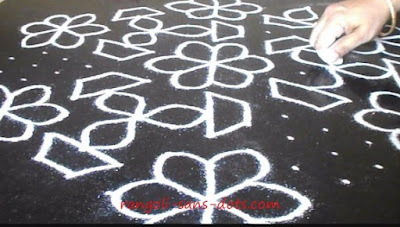 Actually the gallery of kolam in a street appear as if there is a colourful carpet in the entire street. The completed free hand rangoli for New Year ( Puthandu kolam ) as we say in Tamil. 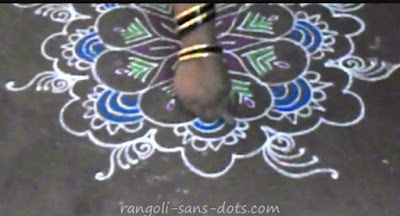 We can add the words around the rangoli using blue and colours used in the rangoli so that they match with the design. 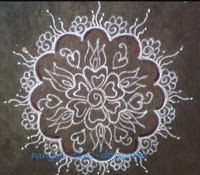 A simple colourful free hand kolam that can be drawn for New Year rangoli for welcoming 2016 is shown through the pictures below. 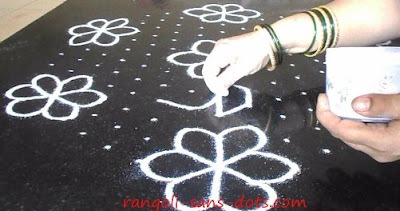 A basic floral pattern is developed with patterns and motifs as shown to get a beautiful rangoli , simple rangoli designs some time may be our best bet to attract attention to our rangoli designs ! 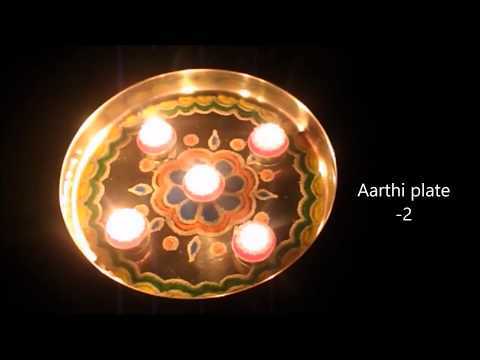 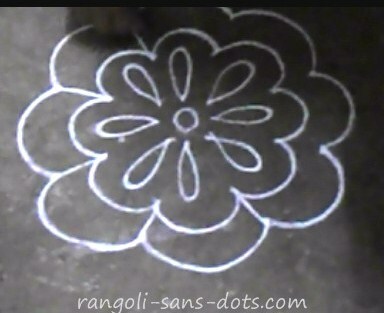 A simple kolam without dots that can be drawn for New Year or a central design for a bigger kolam. 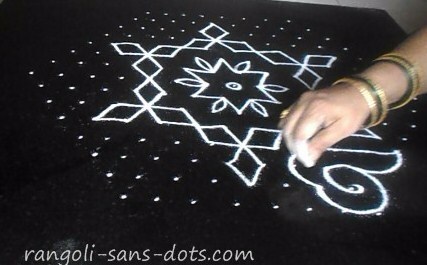 Free hand kolam can be expanded as we wish. The images show the steps - the design starts with big floral petals. 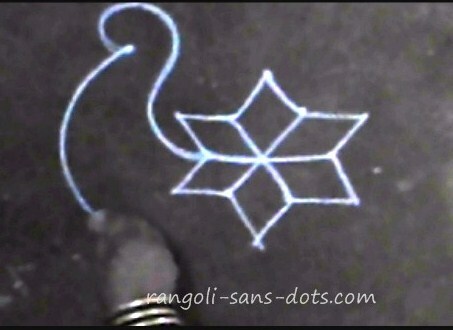 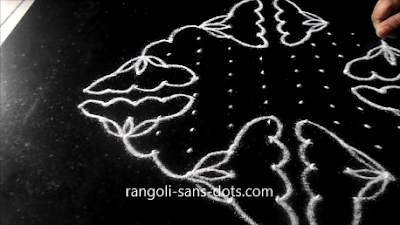 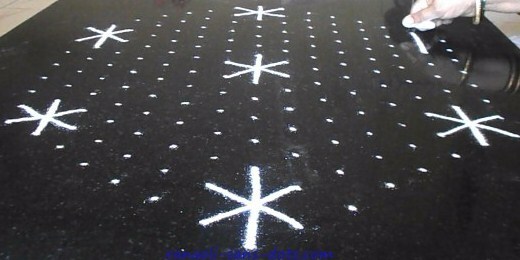 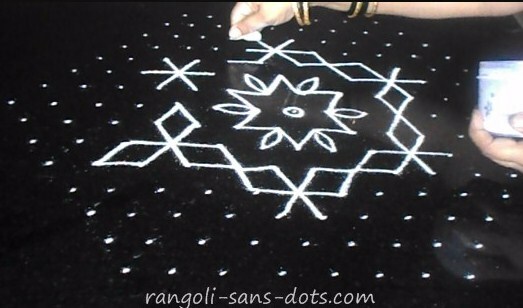 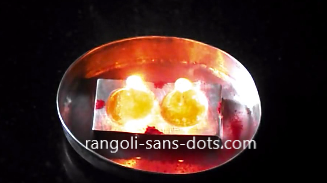 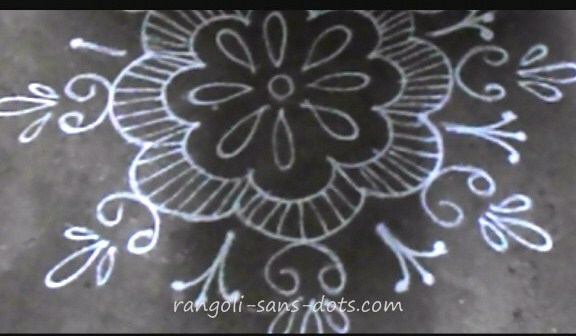 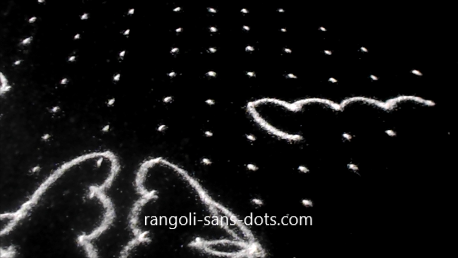 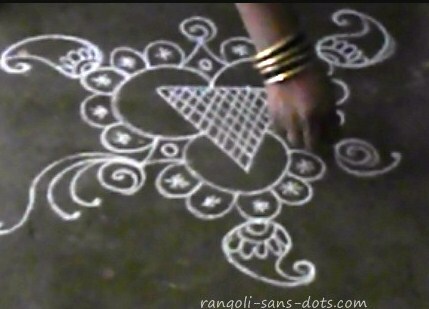 or a simple rangoli with dots - dot pattern is 9 to 5 for New Year. 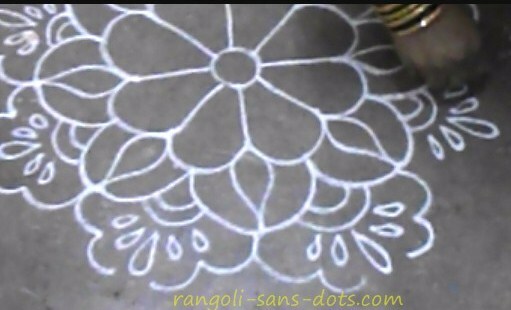 The patterns are very simple we should add colours and designs inside to make the rangoli beautiful. 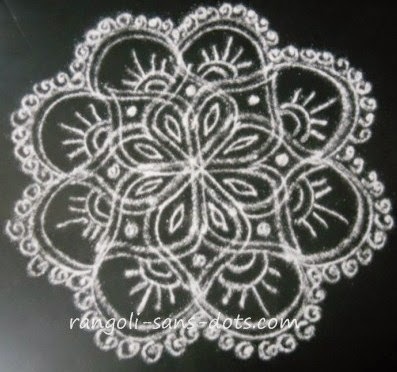 Another free hand kolam , that can be drawn for New Year 2016 or for Pongal 2016. 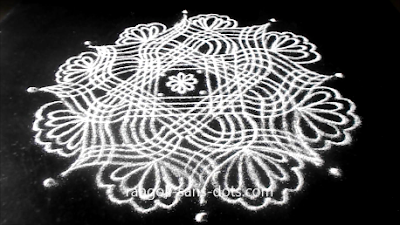 The black and white pics showing the intermediate stages for those who need it. 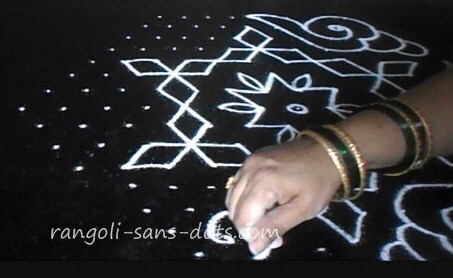 The next kolam muggulu is also with 15 to 8 dots ( idukku pulli ) again a common kolam. After placing the dot grid draw the floral pattern at the centre and on the six sides. After drawing the floral petals draw the lamp like shapes - three numbers as if they are meeting at a point. 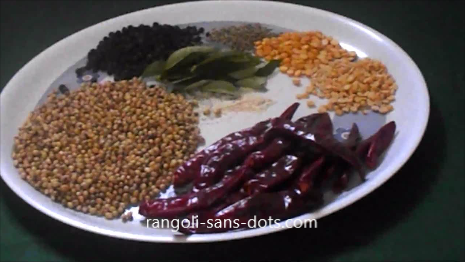 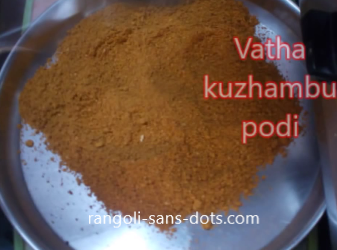 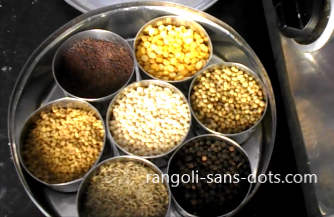 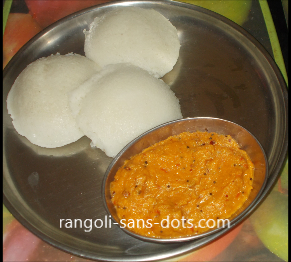 Add a few colours to get a beautiful muggu with dots for Sankranti - it is quite easy too. 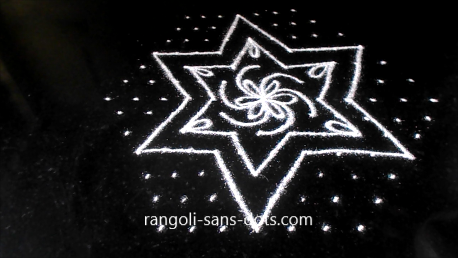 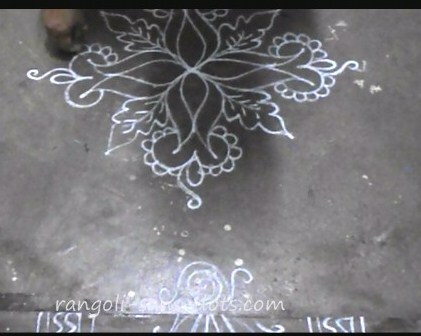 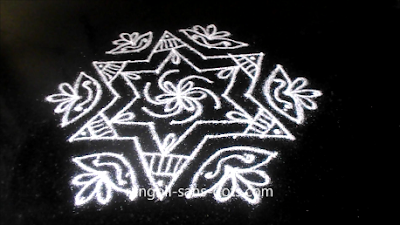 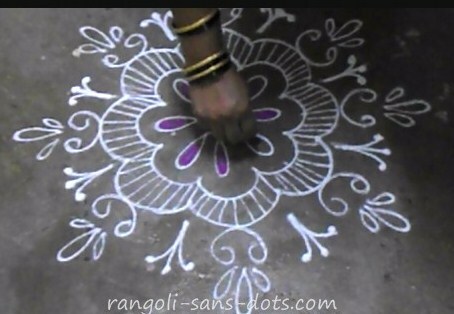 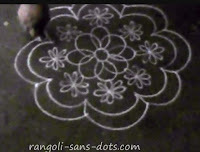 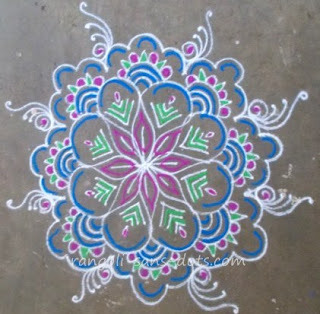 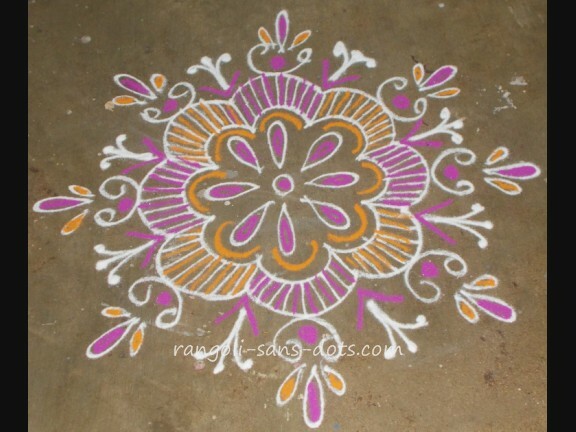 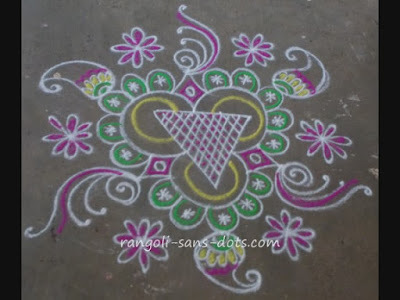 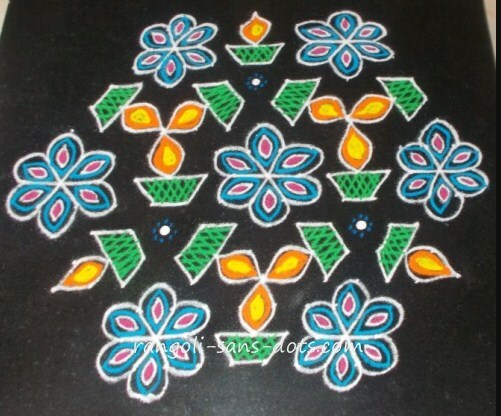 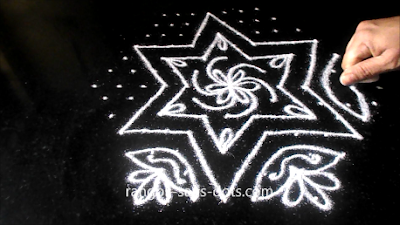 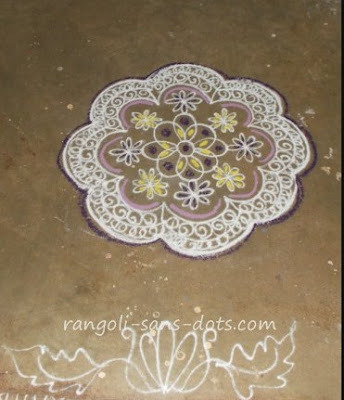 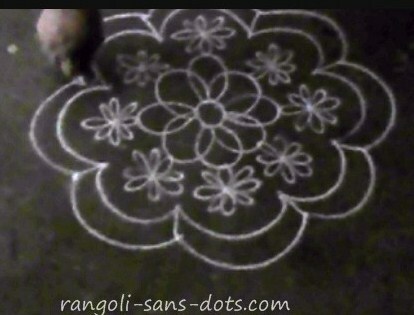 Another free hand rangoli for the Pongal or Sankranti festival in the images showing the steps.